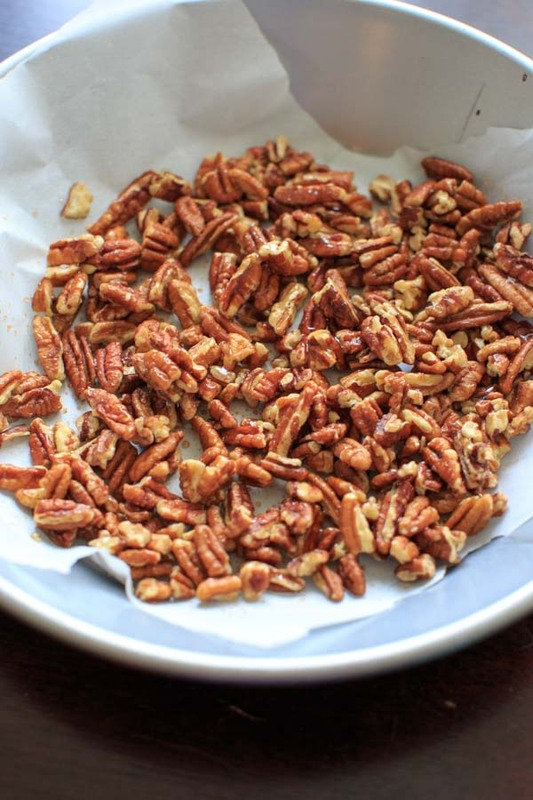 Honey Roasted Pecans – easy recipe with just those two ingredients! Gluten-free snack ready in under 30 minutes including cooling time. Simple recipes like this make me feel like I almost can’t even call it a recipe. Like, you basically know everything you need to know from the title. Except a lot of honey roasted pecan recipes I’ve seen use extra ingredients and/or complicated-seeming instructions. So basically I skipped all the complication and just put honey with pecans and well, roasted it. See? Well I guess you might want to know quantity. And temperature. You’re very particular. Just kidding 😉 See there’s not much to say about such a simple recipe, so I gotta talk about something. Like, how do you pronounce pecans? Pee-can or pee-kahn? I notice I say it differently depending on my mood and the food it’s in. Like if it’s pecan pie I saw pee-kawn pie (sounds fancier) most times. But I said pee-can the other day when I was looking for it in the store. Apparently there isn’t one accepted way to say it, as you discover when you start to google these random things like I do. There are even more ways I’ve never heard of that people say it (see some maps here on different food dialect trends in the U.S.). Anyway, the proportions are 1 tablespoon honey for every 1 cup pecans. I used pecan pieces instead of whole pecans. So this may change the amount of honey-coverage (?) and possibly roasting time if you use whole pecans, so just be aware of that. Pop it in at 350 for 15 minutes (keep an eye on them so they don’t burn! ), then let them cool. And eat. Or use it in things. Like this salad. But they’re also quite good for snacking. 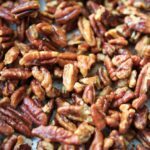 Honey Roasted Pecans - easy recipe with just those two ingredients! Gluten-free snack ready in under 30 minutes including cooling time. Preheat oven to 350°F. Line a baking sheet or dish with parchment paper. Either on the parchment paper or in a small bowl, combine pecan pieces and honey and stir until pecans are evenly coated. Bake for 15 minutes, keeping an eye on them so they don't burn. Let cool for 10 minutes and then they are ready to eat! Can increase recipe as needed - rough proportions are 1 tablespoon honey for each 1 cup pecan pieces. 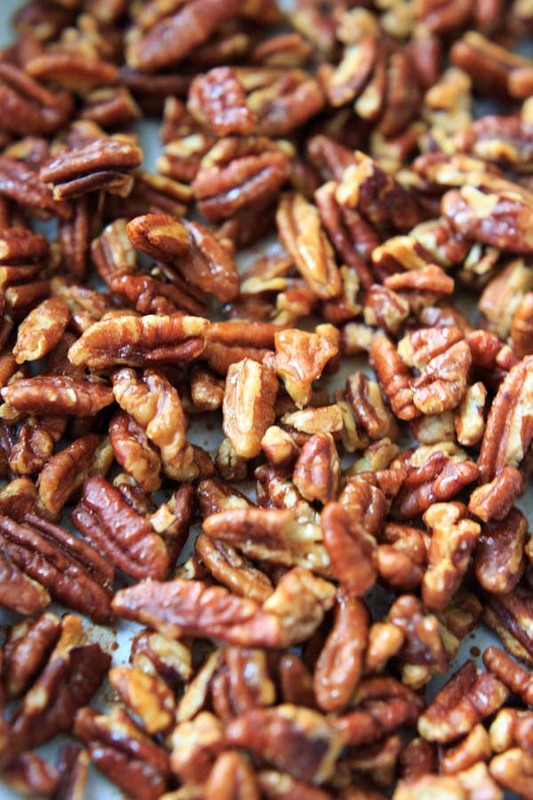 If using whole pecans, you may need to adjust amount of honey and/or baking time. 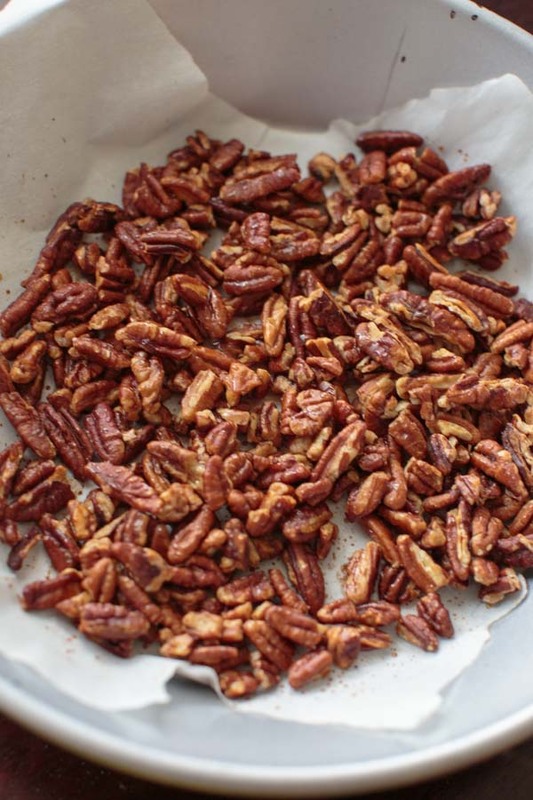 *These pecans go great with this salad. They will likely be a little sticky! Cooling time will help a little. Pee kahn. Pee can is what grandma kept under her bed.